Unless you were hiding under a rock or were out of town, I’m sure you are aware of the Hermès Leather Forever exhibition that is currently taking place until December 13 at the ArtScience Museum. If you have not already been, I would encourage you to gallop on over to it! THE FIFTH COLLECTION decided to make a team outing of it seeing as so many of us were chomping at the bit to go, so last Wednesday the team gathered in the morning at the Asian Civilisations Museum to start by the Little Room of Wanders (sic). That part of the exhibition takes the form of a large cube sitting on its own on the grassy field in front of Victoria Theatre, and houses some of the items from the family collection that is usually viewed by invitation only in the private museum on the top floor of the Faubourg Saint Honoré flagship store in Paris. The collection gives an insight into the roots and inspiration for much of what Hermès is today, starting with items from the brand’s origin in saddlery such as kids carriages, women's riding crops and innovative designs for carriage lighting, and continuing with other objects of fashion and style such as a pair of extravagantly decorated shoes that once adorned Oscar Wilde’s feet. Side by side, these items give the visitor a better intuitive sense of what makes Hermès tick; something that many contemporary customers of Hermès might find surprising how much humour and downright quirkiness form an intrinsic part of the character of the brand, in addition to the better known emphasis on detail, creativity and craftsmanship. Once done there, we headed to the ArtScience Museum at Marina Bay Sands. In our case, weather did not permit us to go by boat, but I’d recommend it as a boat ride would prolong the feeling of travelling back in time. A boat road ride would also set you up for a rush of contrast with the modern architecture and the bright modern colors of the exhibition: between orange boxes piled high, leathers of all colors and types layered on top of each other, and some clever lighting effects to emphasise it all, we felt like kids in a candy store. The fact that you can touch and explore the texture of each skin and analyse each hue up close and without restriction is simply amazing. The exhibition is simple yet so communicates so much: it brilliantly showcases the world of Hermès and how it has evolved with time, an unusual brand with such a long heritage that somehow manages to stay so young and relevant. There is humour (you can ride a mechanic horse and race against someone else) and fantasy: you can see a bag that was made to carry a single apple, and walk through an imaginary forest where smiling bags ride on a swing like little forest elves. There is such a playfulness about the whole exhibition that after showing my daughter pictures of things such as the pegasus motorcycle she asked to go the next weekend and she loved it. I could spend hours describing the pieces on display: some intricate, some fantastic and some simply amazing vintage pieces. But I realized that the magic was not in any particular piece (although there were some amazing ones); the real magic comes from the men and women behind each piece that are made by the house. They are the true fashion heroes as we like to call them on page five, and their passion and creativity is the reason I continue to be excited every time THE FIFTH COLLECTION receives a new piece. The answer is not profound but yet ever more relevant in a world were original design and creation is increasingly giving place by copying and 3D replication. On that note, the highlight of the exhibition for me is in one corner of the main room where an Hermès craftsman sits on the same table as in the atelier and demonstrates the craft of bag, from stitches to finishing handles (I use masculine version of craftsman for convenience, but in this case it was a craftswoman). The great part is that this is truly an interactive experience as you can ask as many questions you want directly to the artisans. I got carried away and monopolized the audience for a bit, but hearing their story and how they acquired the skills, what their biggest challenges are, how certain materials behave differently to others, and what they enjoy the most was as engrossing to me as the best novel. If it hadn’t been for the artisan’s lunch break, I could have spend an entire day talking to them. The table de travail, or working table, on which all the magic happens feels like a Japanese zen garden: nothing unnecessary, organised in functional neatness, and no machines; a real craftsman’s workspace. The first thing that is evident is the pride the craftsman takes in his/her tools, and that is because many of their tools are their own personal property, like a great chef has his own knives. 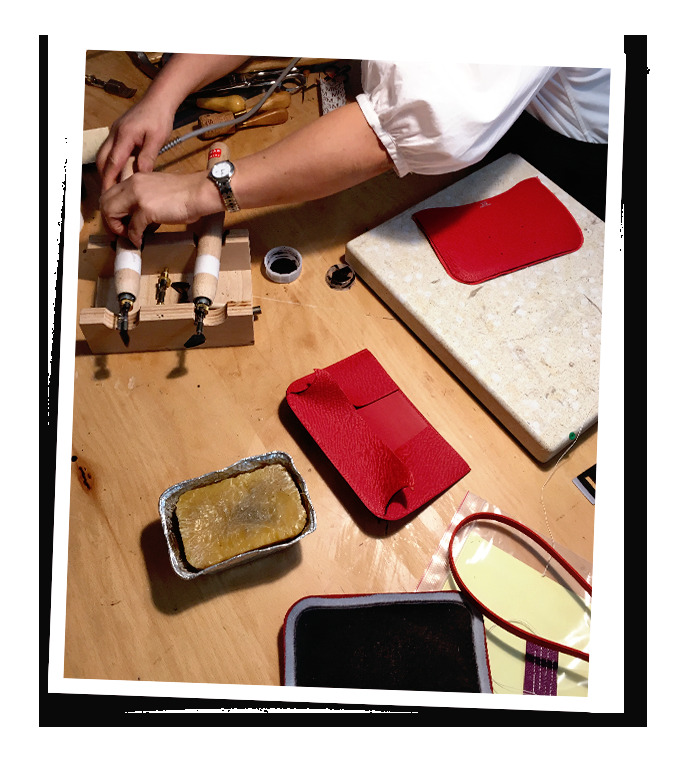 The other thing that stood out was there were only natural material such as beeswax, water glue, leather, linen string. It really boils down to the artisan and his materials, and it means that every bag will inevitably carry the unique signature of the artisan that produced it since each bag is produced by one person. These are really pieces of unique art. Until you talk to an artisans you don't fully realize how much work goes into the making of a bag. Yes, there are some articles out there, but they emphasise the process of making the bag itself, such as that only one person will make your bag from start to finish, that it takes an average of 25 hours to make the coveted Birkin bag etc. But the reality is that it's not about 25 hours, it's about the years of apprenticeship, the patience, the hard work, the rigors, and the striving for perfection. Watching the movements of the artisan polished by time and experience down to surgical efficiency, I thought of Tai Chi: seemingly easy to the uninitiated onlooker, but hard to master and impossible to perfect for most people in their lifetimes. Such hard work to make your bag perfect and ensure it will last hundreds of times longer than the machine made item only appears cheaper at the surface. This craftsman is the guardian of a bag that will carry your history, a bag on which you will leave your mark too before passing it on to the next generation or to the next collector, much like collectors of Chinese art traditionally add their own stamp to a masterpiece before it passes to the next collector. In short, not only should you absolutely not miss the exhibition, make sure you also spend some time chatting with the craftsman, and next time you walk into an Hermès, don’t think of it only as a status object or an investment, look at it also as owning a piece of art that you display on yourself and gets better with time, whose style transcends trend and time.